Sacred sites (24), Access to water (25), Quiet backs (59), Pools and streams (64). After a century of single-purpose management by river engineers, most rivers in most cities in most industrial countries are channelized sewers, encased in concrete. They deny citizens the contact with water that is essential to their spiritual well-being. A host of surveys has proved that access to water is the chief demand in outdoor recreation. 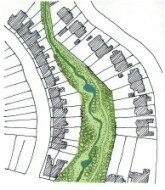 Urban rivers should be converted into blueways, by enabling access to the banks of rivers (Figure 8). When citizens can see the wanton devastation that has been vested upon their rivers, they will demand reclamation programmes. Some waterside routes will be for commuting and some for leisure. Other areas of river, and riverside land, should be closed off to humans, so that wildlife habitats can develop. Sizeable areas of riverside land should be used be for storm detention and infiltration purposes. Still water (71), Holy ground (66).